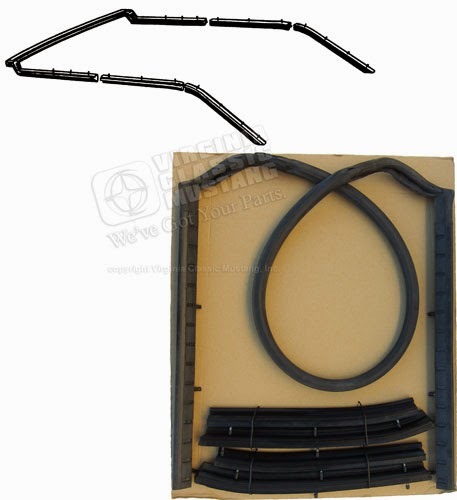 65-68 Mustang Convertible Top Frame Weatherstrip Kit. 5 Pieces. Made just like the original. We are hoping that winter is finally over! It will soon be time to get those Mustang Convertibles out to play! In celebration of the warm (hopefully!) weather, we have a slight price deduction on our Convertible Top Weatherstrip Kits for your Mustang. Over the years, it has been a bit confusing when deciding to buy this kit. Like a lot of Mustang parts, there is more than one choice in terms of quality. This is the nice one, and we have plenty in stock! Order part number WS-40. We also have these weatherstrip kits for 69-70 Mustangs and 71-73 Mustangs.